If you keen of making handcrafted work and Love to experiment with embroidery thread, and enjoy traditional pattern of creativity carved with your own hands, why not sewing some incredible patterns with crochet thread? Get started with crocheting to make eye-catching designs. It's great when you're a beginner and that's the only kind of yarn you know how to work as it is easy to work with thicker thread. It gives a nice lacy look to finish off projects or is easily used for things like crochet, baby blankets, ornaments, decorative cloth, etc. You can also make amazing designs of clothing and napkins. It crochets up beautifully and its fabric gives nice feel to it. Happy Crafting!!! 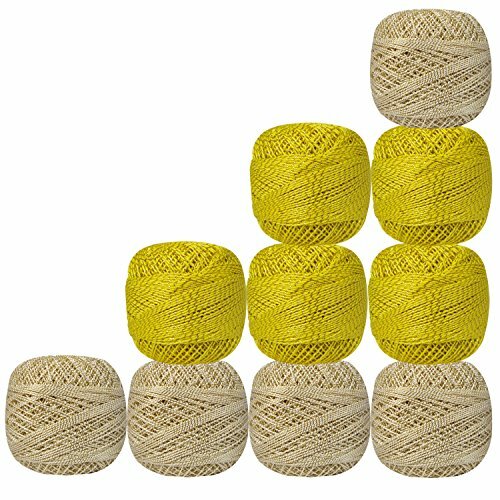 • Ten balls includes five Off-White & five Yellow Color with Metallic Gold Crochet Threads. • Quantity is 10 Balls. • Thickness is 1 mm. • Weight of each Ball is 20 gm. Actual Color may vary from those shown in Images due to photography and screen color settings of your device. Stunning 100% Cotton Metallic Thread for Knitting, Crochet, Embroidery and making Tablecloths, Table Mats, Curtains and Cushions etc. The fiber is soft and smooth which gives you pleasure working. This is exceptionally soft and doesn't get knot easily. This beautiful cotton yarn is suitable choice for crochet projects such as doily mat which is one most common piece of fabric used as a table top. ►►Note: Actual Color may vary from those shown in Images due to photography and screen color settings of your device. If you have any questions about this product by CraftyArt, contact us by completing and submitting the form below. If you are looking for a specif part number, please include it with your message.